Should I Insulate My Garage? - The Wright Door Co. Garages are a great addition to a home – they offer shelter for your vehicles, another entrance to your home, great storage space, and maybe even a workshop or place to work out. Whatever you use your garage for, you may want to consider insulating it. Below we will go over some reasons you may want to insulate your garage and some drawbacks to doing so. If you have an attached garage (built onto your home) or if your home is built over your garage, you could be using more energy to heat and cool your home with an uninsulated garage acting as a wall. If you often use your garage as a workshop or home gym, installing insulation can make it more comfortable year-round. An insulated garage is better for storing paints, chemicals, lawncare products, and other items that are sensitive to temperature and humidity. Insulation tightens up the ventilation in a garage. Unfortunately, with less ventilation to the outside, auto fumes collect in the garage and tend to work their way into your home more easily. Chemicals you use in your workshop will also get into your home more readily. If your garage overhead door is not insulated, insulating your garage will only partially help to control the climate. Create adequate ventilation in the garage. This allows car exhaust fumes and other chemicals to dissipate without entering your home. Choose a compatible insulation – if you have studs but no drywall yet, blanket insulation is easy to install. If the drywall is in place, loose fill or sprayed foam insulation are the best choice..
Have an insulated overhead garage door, like the ones offered by The Wright Door Co installed. 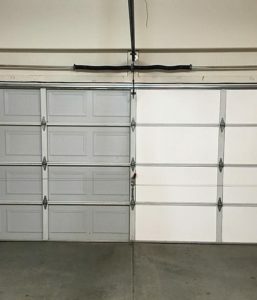 We have a wide variety of insulated commercial garage doors and residential garage doors to meet your needs – see all our residential doors here or click here for insulated industrial garage doors! If you have any questions about Garage Door Insulation or would like us to come and take a look at your garage door please contact us! We’d love to answer any questions you may have.